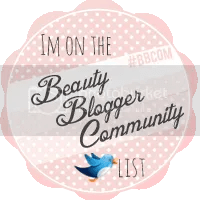 Last week I featured my favorite drugstore My Lips But Better shades, so this week I wanted to share some of my favorite deep matte shades that you can get for under $10. 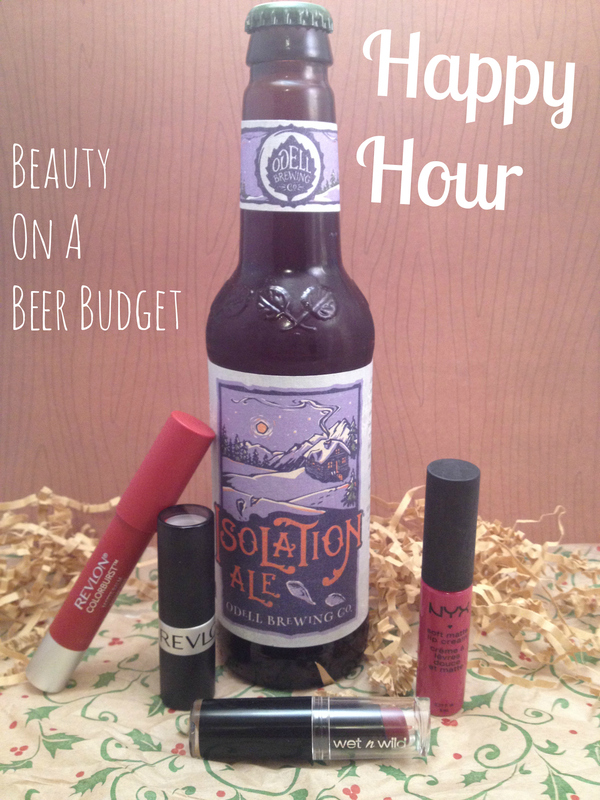 I’m very into red and berry lips in the winter, so that’s what I focused on for this post. Orange matte lips will have to wait a few more months, sorry. 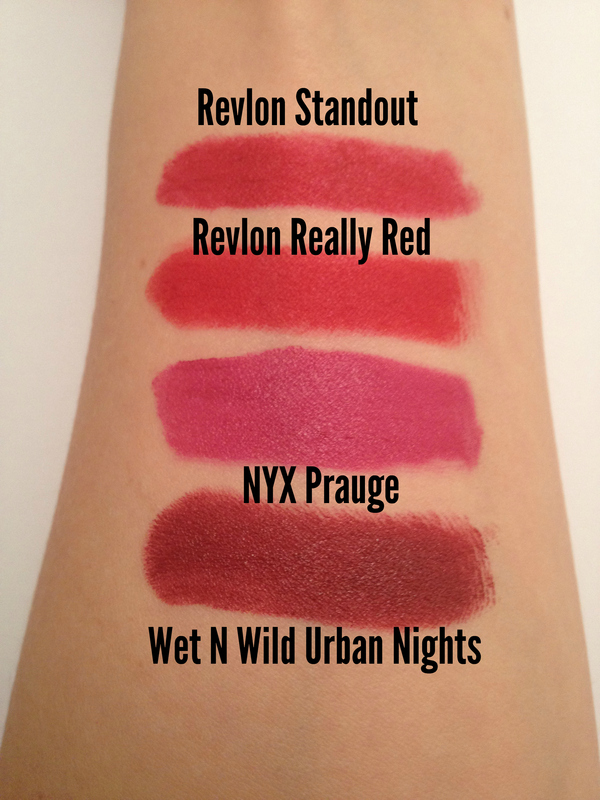 Revlon Colorburst Matte Stick in Standout, Revlon Matte Lipstick in Really Red, NYX Soft Matte Lip Cream in Prague, and Wet N’ Wild Megalast in Urban Nights. Revlon Colorburst Matte Balm in Standout, $7-8. 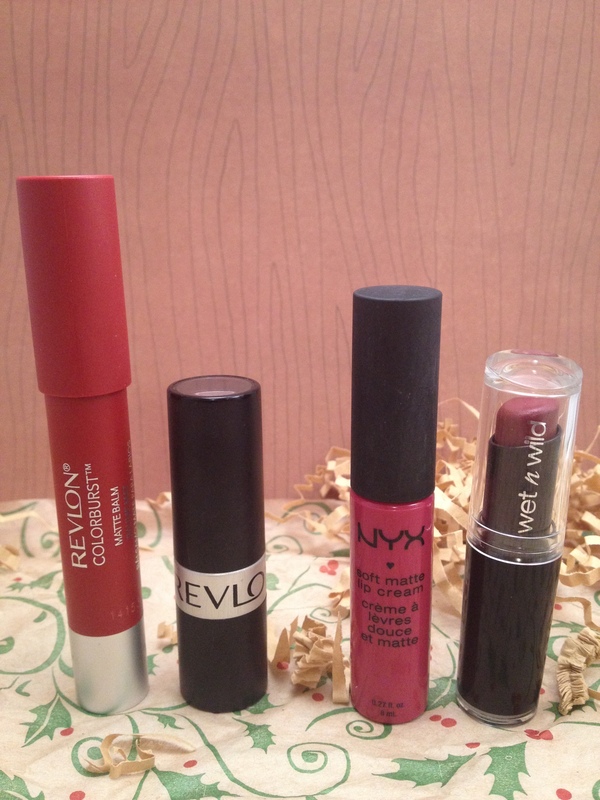 While these matte sticks are not super long lasting, they are lightweight, non-drying, and easy to apply. Standout is a bold red. Revlon Matte Lipstick in Really Red, $7-8. This is a classic. While this matte is not as lightweight at the Colorburst Matte Balms, this color lasts forever on my lips. Even after eating or drinking, it only needs a slight touch up. This is a true classic red shade, and I always feel like a boss when I wear it. NYX Soft Matte Lip Cream in Prague, $6. This is my go-to berry lip right now. The soft matte lip creams are not always the most user friendly matte, but they have lovely colors and Prague is a lovely violet-berry shade that’s very flattering. I also appreciate that this smells like frosting. It’s the little things. Wet N’ Wild Megalast Lipstick in Urban Nights, $2. I love the deep merlot color of this lipstick. It’s about as vamp as I go, while feeling trendy but still in my comfort zone. I also love that I only paid $2 for this and got such a lovely color. Unfortunately, this shade may not be around anymore, I got it in Wet N Wild’s Fall/Halloween display. And somehow it’s different from Urban Night (singular) that I wrote about here, also from there Fall collection. Weird. TL;DR: If you can’t find Urban Nights, try Cherry Bomb or Ravin’ Raisin from the regular line. I’ve been drinking a lot of porters and stouts lately in preparation for my post-Thanksgiving Porter and Stout-a-thon. (Don’t worry I’m not really going to call it that because that’s kind of weird and also hard to type.) 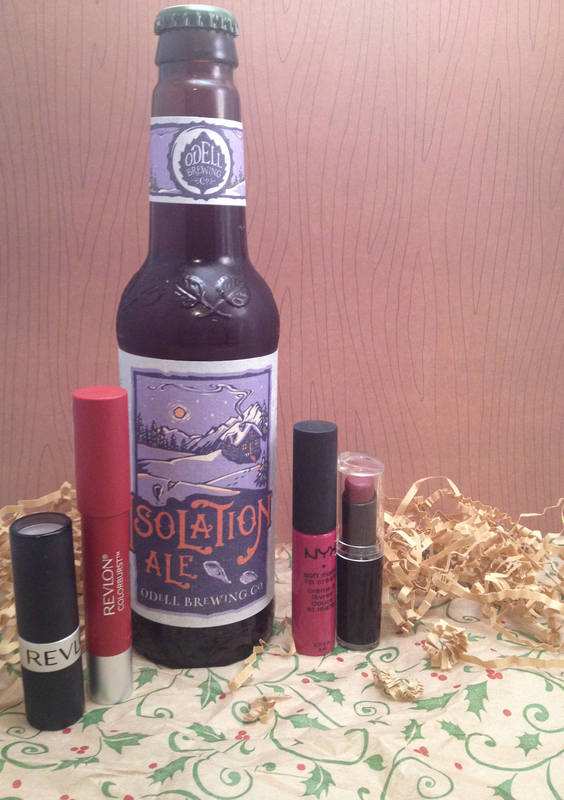 Anyway, I was in the mood for something different, and Isolation Ale called to me. This past week was unseasonably cold for us, and this beer was perfect for that type of weather. It’s malty, with caramel notes and a little bitterness towards the end. I also taste a bit of spices in the background, but the caramel flavor is the most prevalent. It’s 6% ABV, but I think it tastes like a stronger beer than it really is. 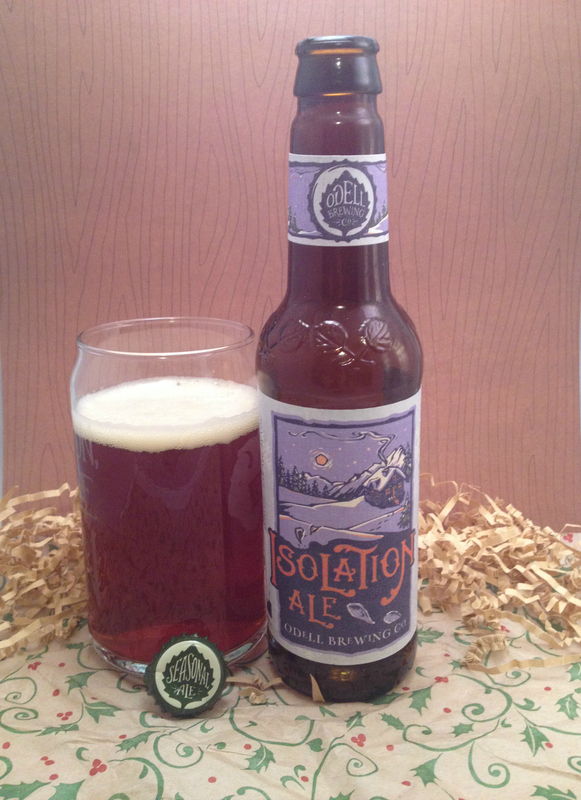 Isolation Ale would definitely be great to sip on while sitting around a fire. If you really wanted to pair food with it, I’d say maybe some toasted marshmallows or Christmas cookies would go great. Also the bottle label is pretty and wintery. That’s it for tonight! I hope you all have a fabulous weekend and #PARTYLIFE. -What’s your favorite matte lipstick color? 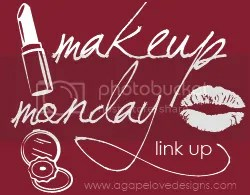 -Have you switched over to winter products? Or are you still operating on fall?